I have gifted a Fossil Q Explorist Gen 3 smartwatch last year. Its an awesome piece of technology, but I've always had one issue. The charger it came with was just a magnetic wireless charging puck that stuck to the back of the watch body, so it didn't look too nice when you sat it down to charge it. 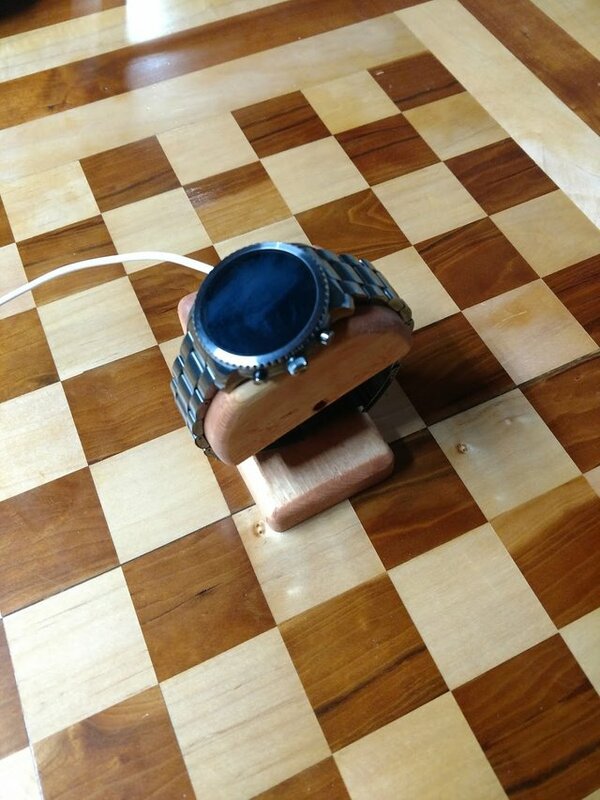 I'd been brainstorming on how to build a stand to charge and display the watch nicely and finally had the opportunity. My grandpa is a bit of a master craftsman, in my opinion at least, so I started talking to him about the idea. He had a few ideas in mind and said he didn't think it would be too hard to manage. The varnish didn't turn out as we hoped, but the watch slips right on and slips into place with the charging puck. I may cherish the charging stand more than the watch in the end because of what it really is down deep. Hope yall have a great one and God bless! I think it looks great! What an amazing memory on top of it. You just got a 0.55% upvote from SteemPlus!